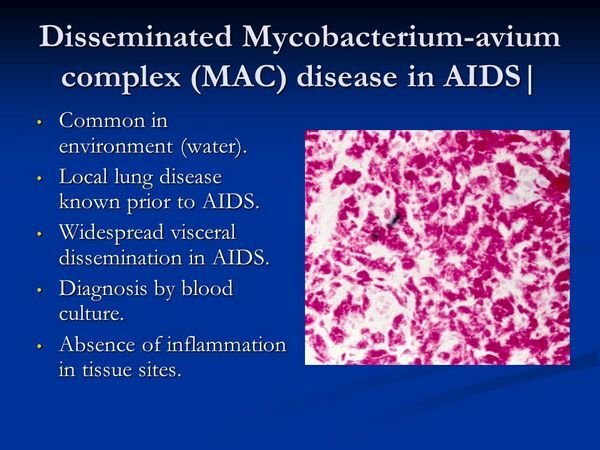 Mavium is the most common atypical mycobacterium to cause disease in humans. 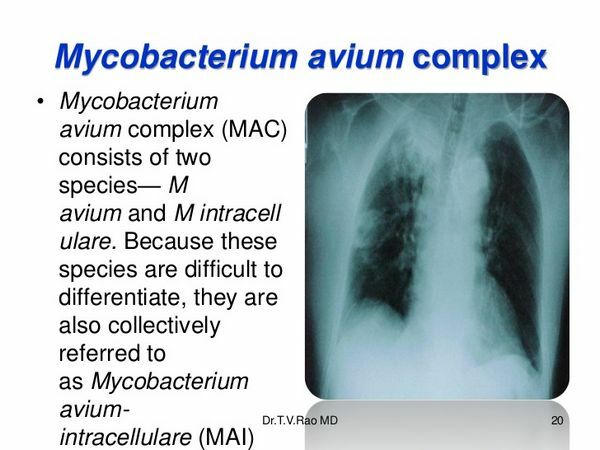 In immunocompetent patients, M avium can cause pulmonary disease (Box 1). It is the most common pulmonary pathogen of all the atypical mycobacteria. There are several risk factors for pulmonary M avium infection besides AIDS. Patients with underlying pulmonary disease, those who have had a gastrectomy, and those with cystic fibrosis can develop pulmonary infection. Pulmonary disease can also develop in a subgroup of women without pulmonary disease but with mitral valve prolapse, pectus excavatum, and thoracic scoliosis. In immunocompromised patients such as those with AIDS who have a CD4 lymphocyte count of < 100, M avium can cause osteomyelitis, peritonitis, oral lesions, and disseminated disease (Box 2). It may also cause colonization without disease in these patients. In children with AIDS, MAC is also common, occurring in 24% of children with a CD4 count of < 100. Patients with underlying malignancies and defects of cell-mediated immunity and those on chronic steroids or cytotoxic chemotherapy are also susceptible. M avium can cause other disease syndromes, including skeletal infections, lymphadenitis, deep subcutaneous nodules, fascitis, panniculitis, and synovitis. In children, it can cause superficial lymphadenitis and cutaneous disease such as ulcers, abscesses, or plaques, and intracerebral infection has been reported. Patients with pulmonary disease caused by M avium infection can present with a productive cough, fever, weight loss, and, less commonly, hemoptysis (Table 2). Symptoms of disseminated disease are constitutional, such as fever, weight loss, and malaise. MAC very rarely causes pneumonia in AIDS patients. Hepatosplenomegaly and adenopathy can be noted by physical exam. Gastrointestinal involvement in AIDS patients can present with three different syndromes, including chronic diarrhea and abdominal pain, chronic malabsorption, and extrabiliary obstructive jaundice secondary to periportal lymphadenopathy. MAC should be suspected in AIDS patients who exhibit all of the following signs or symptoms: CD4 counts of < 100, fever lasting for > 30 days, a hematocrit of < 30%, and an albumin concentration of < 3.0 mg/dL. MAC involving the lung can classically cause pulmonary infiltrates seen on chest x-ray in the upper lobes or disseminated. Chest x-ray findings in these patients can vary from small thin-walled cavities to lobar infiltrates and isolated nodules. In older women, x-ray abnormalities include fibronodular and interstitial abnormalities with upper-lobe predominance. Chest x-rays can mimic reactivation tuberculosis with cavitation.